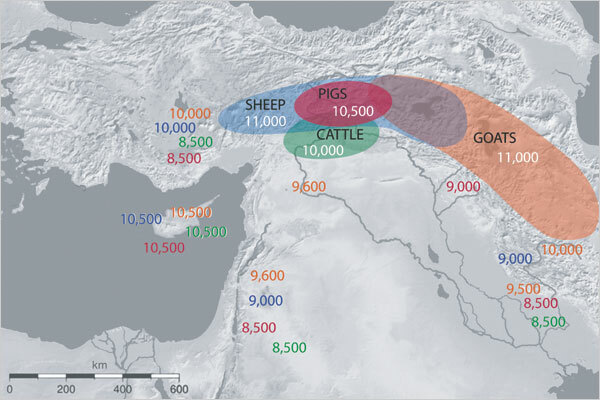 Last week, I shared with you all some research on the Neolithic/agricultural revolution in Iran and Turkey, specifically on barley and cattle domestication. Since then, PNAS has published a related paper, “Domestication and early agriculture in the Mediterranean Basin: Origins, diffusion, and impact,” by Melinda Zeder. Zeder believes that the domestication of sheep and goat happened 1,000 years earlier than previously assumed. She bases this hypothesis on the observation that the previous, younger date is based upon the ‘culling of female goats and sheep,’ who are smaller, more gracile, and manageable. But, according to her, people were herding these animals much earlier. In fact, in places like Cyprus, native species like the pygmy elephants and pygmy hippopotamuses were replaced by introduced, domesticated species such as the sheep, goat, cattle, and pig by 10,500 years ago. Zeder has generated two useful graphs to document the the regions and dates where the four domesticated species were first pastoralized. The evidence from last week’s paper on the milk jugs in northwestern Turkey isn’t included, instead a Zeder marks a 10,000 year old mark for the domestication of cattle in northern Iraq and Syria. In this second graph, it is pretty obvious what the red circles stand for, the dates when farming sprung up around the Mediterranean. Green dots represent the diffusion of agriculture, whereas red and blue dots indicate regions where farmers migrated too and integrated into preexisting populations. From this you can tell that Zeder suggests both a diffusion and assimilation model of agricultural revolution. Hmm. Why does Zeder retrotract the arrival of domestic to places like Western Europe, where that arrival happened in fully developed form and is directly associated with also fully developed crops and specific cultures like Cardium Pottery? Sorry but I make no sense of that. I have no problem with earlier dates for West Asian Neolithic (in fact I have read even older ones in a 1988 manual) but I make absolitely no sense of claiming an earlier arrival of sheep to Spain when it is totally clear that there were no sheep at all before c. 4700 BCE. Maybe there were pigs and domestic rabbits somewhat earlier (this was disputed) but sheeps, goats or cows? Nope. Overall the spread of sheep (necesarily domestic) through Mediterranean Europe went along with Cardium Pottery culture and the C14 dates for the spread of this culture have not been altered AFAIK. So which is her argument to suggest domestic animals and in general Neolithic economy at earlier dates beyond West Asia?